What does it mean if someone requests an extension of time oppose my trademark application, or files an opposition or cancellation against my Trademark? If your trademark application passes muster with the Examining Attorney assigned to your case, you will receive a Notice of Publication. During the publication period, which is 30 days long, third parties can file a formal opposition against your application or request an extension of that 30 day period. If you receive notice that someone had requested an extension, they are likely will reach out to you about the opposition or coming to some understanding or amendment of your application. And if you receive such a notice, or worse, notice that a formal opposition or cancellation proceeding has been filed, you should discuss your options with an attorney. What is an Office Action? What is a Suspension Letter? After you file the trademark application, you may receive an Office Action from the USPTO non-finally rejecting your application based on likelihood of confusion, mere descriptiveness, primarily merely a surname, geographically descriptiveness, etc. There may also be less substantive issues raised, such a request for a disclaimer, a request for more information, or an issue being raised with the description of goods and services or the description of the mark. Often times research and legal argument is needed to overcome an office action. A letter of suspension typically issues when the Examining Attorney has no issues with your application except for the fact that someone filed a trademark application before you that might be confusable with your mark and the Examining Attorney wants to wait to see if that prior application registers before acting on your application. If, however, you have strong arguments that your application should register even if that prior application were to register, you usually can make them in advance of that registration. A disclaimer is a statement on the face of a registration that reads something like NO CLAIM IS MADE TO THE EXCLUSIVE RIGHT TO USE “BREWERY” APART FROM THE MARK AS SHOWN. It basically means, as the text suggests, that you aren’t claiming the exclusive right to a descriptive term, like BREWERY, BREWING CO., IPA, or STOUT. Disclaimers are very typical but you should be careful when agreeing to enter them as they can limit the scope and strength of your registration. What if there is a beer with a similar name to the one i want to use for my brewery (or vice versa), Can i trademark that name? Probably not. If two marks are very similar and the only difference is that one is for a Brewery or Brewing Co. and the other is for a particular beer, you likely aren’t going be to be able to register your brewery name. If for example you wanted to trademark Rainbow Unicorn Laser Eyes Brewery, but someone already had a registered trademark for Rainbow Unicorn Laser Eyes IPA, your application would almost certainly be rejected. What if there is a trademark out there for wine or spirits that is similar to my beer trademark? 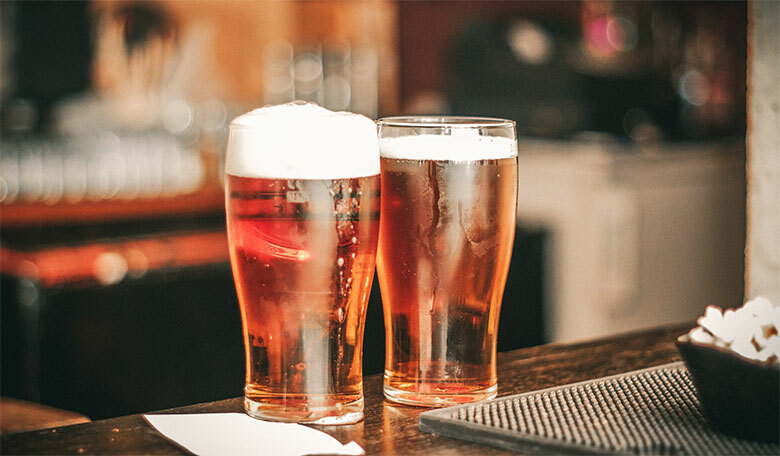 The United States Patent & Trademark Office (USPTO) does, with some regularity, find that different types of alcoholic beverages are related for trademark purposes. You’ll want to take this into account when choosing brewery and beer names and include all alcoholic beverages in your trademark search. When do I use the TM symbol? When do I use the ® symbol? The ™ symbol is used with unregistered marks, i.e., brewery and beer names for which you don’t have a federal trademark registration. The ™ for trademarks, or marks that represent goods, and ℠ for service marks, or marks that represent services. The federal registration symbol, or ®, can only be used when you have the federal trademark registration. It is not required that you use either, but it is advisable. The government charges a filing fee of $225-$275 per classification. After we run a quick trademark search we can provide a fair estimate for your legal fees, and we’ll stick to our estimate or let you know if it needs to be updated. Typically about six to twelve months. Do I have to be selling beer before I can apply for a trademark? No. You can apply for federal trademark registration on an intent-to-use basis as long as you have a bona fide intent to use the name in commerce. Typically you can file up to roughly 3 years in advance of actually selling beer as long as you file the appropriate extensions. I applied for a trademark on my own and just received an Office Action from the USPTO rejecting may application, is it too late to get an attorney’s help? No, we frequently are called in to help with existing applications and to draft responses to pending Office Actions.